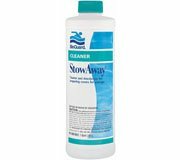 Winterizing chemicals only last through the winter! As temperatures rise in the spring, the water under the pool cover begins to heat up. Even though the pool is not exposed to the sun, the warm water under the cover begins to encourage the growth of bacteria, water molds and algae. 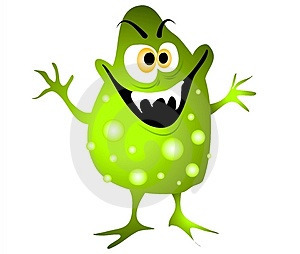 Very quickly, any traces of sanitizing chemicals left in the water disappear as they react with the growing organisms. This leaves the pool water unprotected. This has now become the perfect environment for bacteria, water molds and algae to grow and multiply very rapidly. Problems always cost more than prevention! Some pool owners think they are saving money by waiting until the end of May or early June to uncover and begin operating their pool for summer. This couldn't be further from the truth. 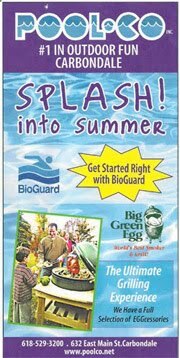 For a really green 10,000 gallon pool, you would need, on the average at least 10 lbs (usually much more) of a superchlorinating product, a bottle of flocculant, a bottle of stronger-more costly algaecide to fix the problem. For the same sized pool, opened 4 weeks earlier, you would need on the average 1lbs of superchlorinating product per week, 2-3 Smart Sticks per week, 3 ounces of algaecide per week. Not factored into the first scenario above...YOUR TIME and TROUBLE! Plan to attend Pool School at POOLCO! Tighten all hose connections - SUPER TIGHT! 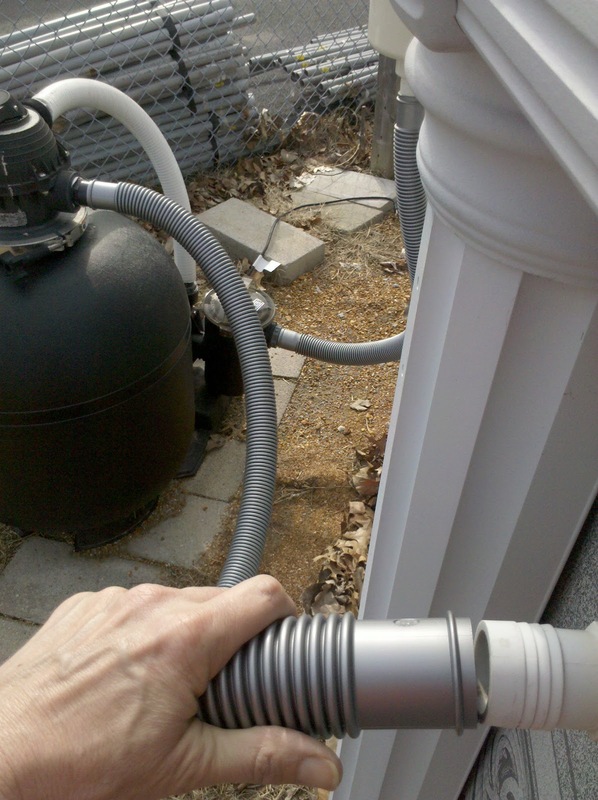 The manufacture of flexible filter system connection hose recommends changing these annually. Biofilms develop inside the hoses that will require additional chemical treatment. How high is the water level? If there is enough water added to the pool - and the water is clear (you can easily see the bottom) - then beginning running the filter system. Immediately test and chemically treat the pool water. Winterizing chemicals are often used up by end of April, sometimes sooner, if winter and spring temperatures were above average. 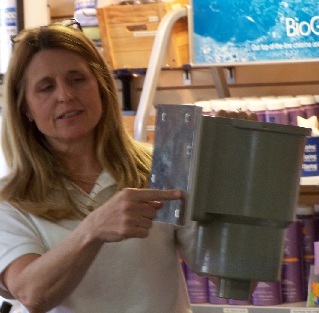 Bring a sample of water (16 ounce) to POOLCO for a complete water analysis. We will make opening dosage recommendations and customize your instructions based on your pool's needs, your budget and your time! ** If there is a layer of fine dirt (or worse) on the bottom of the pool you must remove this from the pool. Come see us with a water sample for how to best handle this situation. Our friendly advice is always free! Relax, shopping for a hot tub is fun and easy at PoolCo. Due to the number of brands, products, features and options available, choosing the right hot tub can be an overwhelming process. Our friendly staff is happy to help you find the right hot tub at the right price for you. Shop on your schedule and in your shopping style. Smart Shoppers love us! Intelligent shoppers know that a little detective work before buying will actually save them money in either the purchase price or repair savings. Price is important, but it's only a part of the whole story. Sharing what makes a hot tub a great value takes longer than 30 seconds. Decide how much you can and should spend to get the best value. Remember that the cheapest buy is not always the smartest buy. Quality goes a long way. How do you see yourself using this product? Will this product live up to your expectations? Develop a checklist of what features will be the most important to you. List them from most to least important. Next to each feature, briefly explain why that feature it is important to you. Keeping our promises for over 37 years!